These Pop-Tarts are pretty good. There's nothing new going on. It's just familiar flavors doing what you expect them to do. I can be a harsh critic when it comes to toaster pastries. 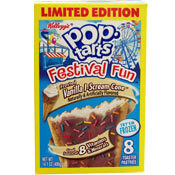 Back in 2008, I found Kellogg's Vanilla Milkshake Pop-Tarts to be "dull" with "less flavor than any brand of toaster pastry." I'm genuinely surprised that I liked this new variety. The vanilla filling appears to be the same used in the Pop-Tarts I panned. The combination of that filling with a traditional chocolate Pop-Tarts frosting seems to bring out the vanilla flavor, a flavor that's muted and lost if there's nothing to contrast it with. 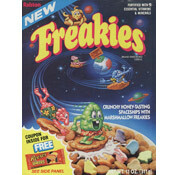 The name of this product and the images on the box would lead you to believe there's some kind of ice cream familiarity in the flavor. That's not really the case. I was reminded more of commercial chocolate chip cookies and, to a lesser degree, cream-filled cookies like the Oreo. I tried this product toasted, plain and frozen (as suggested on the box). I liked them best very lightly toasted. My least favorite option was frozen which made the filling stiff and slightly chewy. In the end, I won't scream that I love Vanilla I-Scream Cone Pop-Tarts. I'll just gently whimper that if you're into this kind of thing, you probably won't be disappointed. As with all toaster pastries, I strongly advise that you treat these like treats. If you've eaten fairly healthy for several days, there's nothing wrong with a rare indulgence. Just be careful. Two of these Pop-Tarts have 380 calories and 32 grams of sugar. Nutritional Considerations: Each SINGLE pastry serving has 190 calories, 4 grams total fat (1.5 grams saturated and 0 grams trans), 37 grams total carbs, less than 1 gram dietary fiber, 16 grams sugar and 2 grams protein. 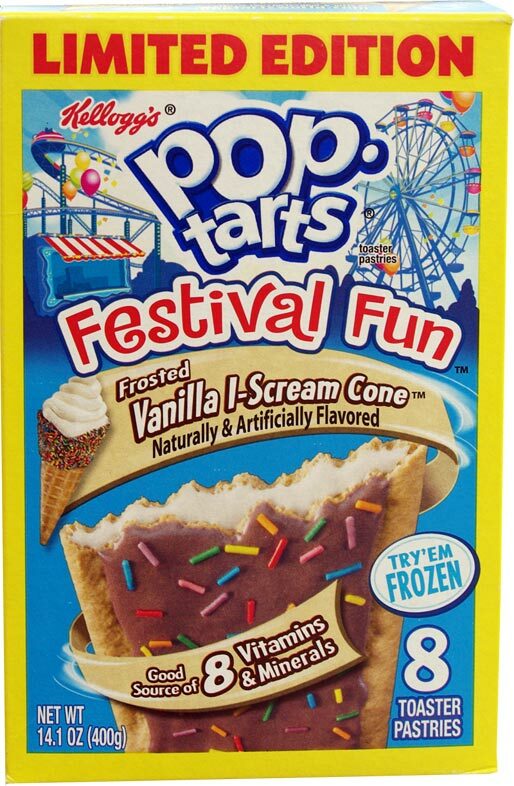 What do you think of Vanilla I-Scream Cone Pop-Tarts? 8 Whole Minerals? Wow, goodbye 5 a day.